Alumnae initiation exemplifies Alpha Sigma Alpha’s commitment to lifetime membership. Potential alumnae initiates include chapter advisors, college faculty or staff, family members, friends or co-workers of initiates, or any woman of poise and purpose who expresses interest in Alpha Sigma Alpha. Do you know a woman who missed her opportunity to join a sorority? It’s never too late for us to welcome members into our sisterhood. Alumnae initiation is a wonderful and thoughtful way for you to show someone how much you care for her. 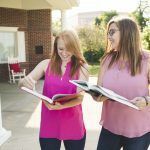 Whether it’s your mother, cousin or friend, sponsoring an alumna for initiation into Alpha Sigma Alpha will surely turn into a bonding experience for the two of you. We hope that you will recommend someone for this exciting opportunity. Are you interested in sorority membership as an alumna?